Rio Mirage Café first opened its doors in the humble City of El Mirage, near the Agua Fria River (Rio) on September 12, 2000. The dry riverbed, which is where we created the name, is located down the street where I grew up. We established this restaurant to provide all our communities and neighbors a modest place to enjoy their favorite Mexican meal with their families and old friends and continue making new Amigos in the best tradition of our culture. Your choice of beef or chicken, smothered with green chiles, olives, tomatoes, green onion and cheese on a crispy tortilla. Fresh Hass avocado, Mexican spices, jalapenos, diced tomatoes, and fresh roasted chiles blended into a tasty, spicy dip mix served with mini tostada chips. A crunchy flour tortilla shell piled with spicy Shredded Beef or Mexican chicken, crisp Romaine lettuce, shredded mixed cheese, diced red tomatoes, green onions, guacamole, sour cream and sliced black olives. Grilled Shrimp, avocado slices, fresh bell peppers, red onions, avocado, tomatoes, and olives on a bed of crisp garden greens served in a crispy tortilla shell. Marinated strips of grilled steak or chicken, and red bell peppers, onions, avocado, tomatoes, and olives on a bed of crisp garden greens topped with a sprinkle of cheese served in a crispy tortilla shell. A salad grilled chicken on a crisp colorful mix of fresh garden greens, avocado, topped with corn, black beans, tomatoes, onions, olives, and cheese. Small meatballs with rice and seasonal vegetables in a tomato broth soup served with warm tortillas. THIS ESTABLISHMENT SERVES HUEVOS RANCHEROS AND HUEVOS MEXICANOS, WHICH CONTAIN EGGS THAT ARE NOT FULLY COOKED AND HAMBURGERS COOKED TO ORDER. CONSUMING RAW OR UNDERCOOKED MEATS OR EGGS MAY INCREASE YOUR RISK OF FOODBORNE ILLNESS ESPECIALLY IF YOU HAVE CERTAIN MEDICAL CONDITIONS. A soft flour tortilla filled with your choice of grilled chicken or grilled steak, sautéed with bell pepper & onions topped with red enchilada sauce & cheese. Served with Guacamole & sour cream. Your choice of marinated grilled chicken or steak sautéed with chiles, fresh sliced onions, chopped cilantro, ripened tomatoes, and spices, topped with ranchero sauce, Monterey Jack & cheddar cheese & sour cream. A deep-fried burrito filled with slow simmered tender Mexican Chicken and spices in a flour tortilla, smothered with green sauce, topped with Mexican cream cheese, & mixed cheeses. Tender marinated inside skirt steak in thick slices, sautéed and simmered with onions, tomatoes, and bell peppers in our special spices, topped with our very spicy hot green sauce. Char-broiled thinly sliced inside skirt steak basted in lime and garlic butter topped with grilled onions and peppers. Shredded roast beef sautéed with our unique spices, onions, tomatoes, green chile peppers and jalapeno peppers topped with spicy Ranchero sauce. Succulent jumbo marinated shrimp grilled with skewered seasonal vegetables. Served on a bed of rice. Scrumptious jumbo shrimp sautéed with bell peppers, onions, chiles, tomatoes, garlic, smothered with spicy jalapeno ranchero sauce, served on a bed of Mexican rice. Perfectly char-grilled chicken, zucchini, bell peppers, onions, mushrooms and tomatoes cooked al dente topped with cheese and slices of Avocado. Perfectly marinated and slow roasted pork carnitas. Fresh Pico De Gallo and a side of our tasty Tomatillo Sauce. 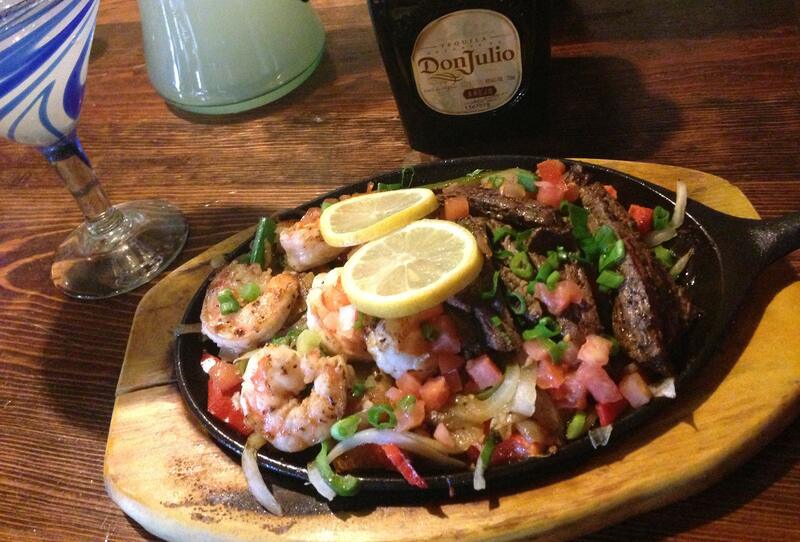 Served with Mexican Rice, black or refried beans & fresh hot tortillas. Soft corn tortillas traditionally filled with smoky slow cook pork in a tangy tomatillo sauce, topped with Mexican queso fresco and crema. Served with your choice Rice and Black Beans. Also, other choices are Mexican Chicken, Machaca, or Cheese. Enchilada stuffed with shrimp and imitation crab mixture, sautéed in a blend of Mexican spices and vegetables topped with ranchero sauce and sliced avocado. Enchiladas stuffed with our special sautéed spinach & slow cooked Mexican Chicken topped with Monterey and cheddar cheese baked in a delicate spicy enchilada sauce and topped with cool real sour cream. Shredded beef, chicken or cheese enchiladas smothered with spicy ranchero sauce and melted cheese, topped with cool, real sour cream. Served on a sizzling skillet, sautéed with fresh garlic, red and green bell peppers, tender onions and our special seasoning, Pico de Gallo, black or refried beans, Mexican rice and one order of your choice of fresh hot flour or corn tortillas. A flour tortilla stuffed with Mexican chicken or Savory shredded beef, Monterey Jack & Cheddar Cheese, green Chiles rolled and grilled crispy golden brown. Served with guacamole and sour cream. Grilled Chicken or Steak Fajitas with grilled onions and bell peppers. Everybody’s all-time favorites created with the goodness of home, using only the finest ingredients. with black beans, Cilantro Pineapple salsa on the side and Caliente house tartar sauce. Tacos made with soft corn tortillas, filled with lightly breaded whitefish, spicy cabbage, pico de gallo, and Baja sauce. Grilled soft corn tortillas filled with char-grilled marinated steak, or chicken & pico de gallo. Soft corn tortillas filled with char-grilled shrimp topped with avocado and pico de gallo. 11. Two Tacos and Cheese Enchilada. Kids 8 years and under Menu is child size serving and includes a choice of one entrée below and a side of rice, or beans, and a soda. Served with Mexican Rice and Refried Beans, or with a fresh Garden Salad.